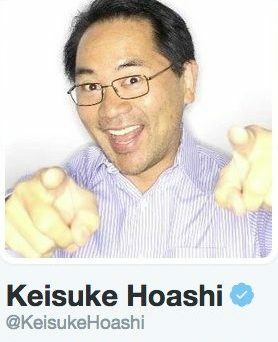 Keisuke Hoashi is among the most recognizable Asian EveryMan actors in Hollywood with more than 80 national commercials and another 80-plus TV and film roles to his credit. Recent appearances include THE DETOUR (TBS), LAW & ORDER TRUE CRIME: THE MENENDEZ MURDERS (NBC), ADAM RUINS EVERYTHING, WILL & GRACE, and a series regular role on the upcoming season of STARTUP. 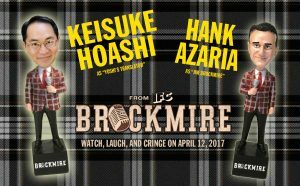 Keisuke (pronounced “Case-Kay”) is known for his mild-mannered appearance, deadpan wit, and ability to play over-the-top characters, both American and Japanese. His trademark skills have spiced up hit shows like JIMMY KIMMEL LIVE! 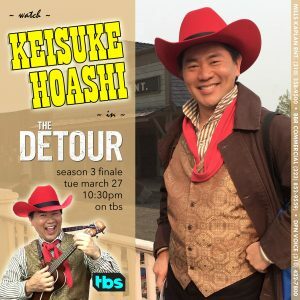 (as Hello Kitty’s very emotional Greatest Defender); BOB’S BURGERS (as the voice of Japanese action movie star Hawk ‘Koji’ Kojima); and THE DETOUR (as a wildly enthusiastic Japanese gazillionaire cowboy LARPer). Like many actors, Keisuke begin his career in the theater. But unlike most, he started by shattering stereotypes by winning major, non-Asian-specific roles in productions of “1776,” “My Fair Lady,” “The Last of Mrs. Lincoln,” and “Anything Goes.” He has performed on stage with the Geffen Playhouse, the Venture West Theatre Company, the Classical Theatre Lab, Gily Productions, and Fire Rose Productions. A writer and musician, he wrote, produced, and performed in the world’s first Martial Arts Musical Comedy, “Memoirs of a Ninja,” with composer Brian Lewis. The satirical work won five Maddy Awards, five Garland Awards, and was honored as a “The Best Theatre 2000” pick by NiteLife After Dark magazine. In 2006, Keisuke co-founded the New York Summer Music Festival, a summer camp for talented young musicians ages 10 to 25. He created their “Hollywood in Oneonta” program and taught daily classes in filmmaking, acting, and original musical theatre production until 2012. He is also a founder of the Michigan Performing Arts Camp and taught at the Hartwick College Summer Music Festival and Institute. Keisuke holds a Masters in Technical Communication from Rensselaer Polytechnic Institute and a B.A. in English from the State University of New York, Potsdam. He is a native of Queens, New York and a graduate of Stuyvesant High School.